In the light of the events of the past decade, among the words that have been most written on and debated about and have made many inquisitive minds read about Islam is the word ‘jihad’. What does the holy book of Muslims say about jihad? What place does this word have in the life of a believer? Can the present militancy be termed jihad? These and other related questions have been dwelt on in detail in this book by Maulana Wahiduddin Khan, one of the most eminent Islamic scholars of modern times. The Quran exhorts believers to “strive for the cause of God as it behoves you to strive for it.” (22:78) This earnest struggle is expressed in Arabic by the word ‘jihad’, which is derived from the root ‘Juhd’, which means to strive, to struggle, that is, to exert oneself to the utmost to achieve one’s goal. The Maulana writes, “This world has been designed with a view to fulfilling the purposes of the divine trial of man.” Any situation that he is faced with is meant as a test for man. For instance, when a matter of truth comes before a person and he fails to acknowledge it for fear of losing his status; when he has someone’s wealth or property in his possession, and he hesitates about restoring it to the true owner; when he resents having to place curbs on himself in order to lead a life of modesty as desired by God, when he feels that suppressing his anger and vengefulness in order to be patient amounts to his own negation; when he fails to speak words of truth and stand up for justice for fear of losing his popularity. On all such occasions man has to tread the right path. It is this spiritual struggle within a believer in order to become God-conscious that constitutes the true spirit of jihad. It continues throughout the life of a believer. If jihad connotes inner striving, then what about those activities which use the same word to indulge in violence? The Maulana explains that since the early Muslims had to strive hard during wars with aggressors, these wars came, in an extended sense, to be called jihad. The actual word for such a war in Arabic is Qital, not jihad. War, in Islam, however, is not the prerogative of the individual but of an established government. Most Islamic activities are governed by certain conditions, the author explains. The waging of war is also thus subject to certain principles. The Prophet of Islam started his mission in Mecca in AD 610. Several incidents of the Meccan period record the atrocities inflicted on the Prophet and his followers by the opponents to his mission. However, the Prophet never engaged in confrontation. After thirteen years of peaceful dissemination of Islamic teachings in Mecca, when his opponents planned to assassinate him, the Prophet migrated to Medina. Here, most of the inhabitants embraced Islam, and a city-state was established. Since the opponents in Mecca desired to nip Islam in the bud, they launched armed aggressions against the state of Medina. It was here then that verses pertaining to war were revealed in the Quran, and the Prophet was enjoined to engage in war in self-defence. An important principle that can be derived from this early history of Islam is that war can be waged by a state, not by non-state actors. There is no room for non-state warfare in Islam. Also, war in Islam is for defensive purposes alone, when the option of peace and negotiations has failed. The book enumerates various incidents from the life of the Prophet that shows the founder of Islam always made effort for avoidance of conflict. “The position of peace is sacrosanct in Islam,” says the author and cites numerous references from the Quran and the sayings of the Prophet of Islam to enlighten the readers on the role of peace in the Islamic doctrine. The Quran avers that “reconciliation is the best” (4:128). The Maulana explains that Islam is a mission. As pointed above, according to Islam, in the present world man is being tested by God. God desires that man should know how he has to spend his life on earth and that he would be held accountable for his deeds in the next world. Islam is a spiritual mission which aims to make people aware of their Creator and the Creation Plan by conveying His message to them. “When a state of war and violence prevails, the normal atmosphere is vitiated. Such circumstances as would foster spiritual reformation and intellectual movements cannot be effectively created.” This implies that peace is actually a necessary prerequisite for the Islamic mission. Besides, all constructive activity—in the field of education, business, industry, even worship—can flourish only where there is peace. How, then, can Islam afford to sanction an activity that puts peace in jeopardy? The author reiterates that Islamic activism is based on non-violence and Da’wah. Da‘wah is the peaceful propagation of the teachings of Islam. The Maulana advises Muslims of present times to adopt this Da’wah activism and abandon every kind of violence. This will guarantee divine succour, on the one hand, and on the other hand, shall foster among Muslims positivity and well-wishing for people of other faiths. Following this, they can achieve success in this world and in the Hereafter. Maulana Khan establishes in this instructive book that it is not reformation of Islam but, rather, a revival of true Islam that is needed today. The original Islam is based on peace, mercy and love for mankind. 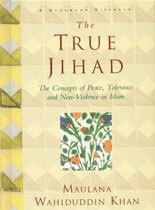 The True Jihad offers a wonderful insight into the ideology of non-violence in Islam. It serves as a guide for both general readers and students of Islam. Maria Khan is a PhD candidate at the Department of Islamic Studies, Jamia Hamdard, New Delhi She is a member of the Delhi-based Centre for Peace and Spirituality. Excellent introduction to what promises to be a very worthwhile book.